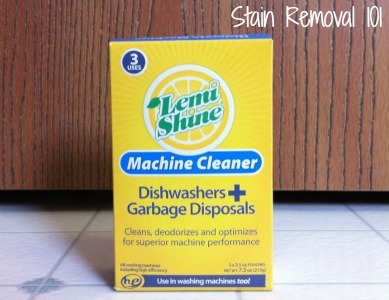 I recently got a box of Lemi Shine Machine Cleaner, which is a product designed to clean three different appliances in your home - your dishwasher, garbage disposal and your washing machine. I had three packets so I used one on each appliance and what follows is my reviews of how this product worked on all three types of machines. 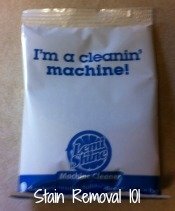 Before I begin though here's some background information on what Lemi Shine is -- it is a citric acid based product (it also has some other ingredients as well) and it designed to clean, deodorize, and remove hard water build up from your machines. I think I've finally found a good dishwasher cleaner for me with this product -- because it pours right into the bottom of your dishwasher, clearly removed hard water build up in the machine, and was easy to use. This stuff comes in packets (see picture to the right), and when you open one it has little white crystals inside, and they smell very much like lemonade. Obviously, it's not for drinking, but it smells divine. The instructions for cleaning your dishwasher say to pour the contents of the pouch into the bottom of your empty dishwasher, and then run like normal once you're using the product consistently. build up that had been accumulating despite the fact that I've used quite a few other dishwasher cleaners on this machine in the last few months. Below is a picture of the fizzing in action. I will note that the instructions advised for the initial treatment to pause the cycle the first time and keep the water from draining so it could soak for 4 hours with the citric acid able to really work on the hard water build up. Sounds like a great idea but I have absolutely no idea how to do that with my machine so I just skipped that step. I've also now tried the dishwasher detergent additive version of this product, and I'd love for you to read my review for that as well if you're interested. I noted that it also helped clean the hard water build up from my machine, as did several other reviewers who shared their experiences with the original powder version. Has anyone else used this product in their home? If so, I'd love to hear how it worked for you. You can share your dishwasher cleaners reviews here, or read even more that have already been submitted. You can also scroll down below to read how this worked for me in the other ways I've used it. I had just used the plain Lemishine dishwasher detergent to clean my dishwasher. A few months ago my dishwasher had water plugged up on the bottom. I ran multiple empty loads with ADD LINK vinegar only, and still lots of water on the bottom. 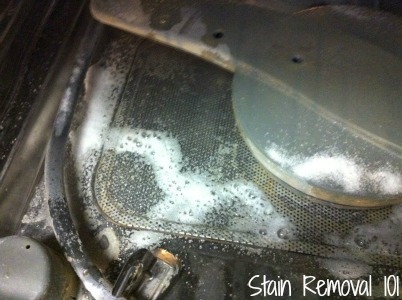 I read about Lemishine, ran it in the detergent with hottest water setting on my machine and noticed improvement. I had to do it 2 more times, but it cleared it all out. It even got the soap scum off my dishwasher racks!!! Now I use it once a month for maintaining a clean, functional dishwasher. I love this product! As I mentioned above I also used this product to clean my garbage disposal and washing machine. As impressed as I was with this cleaner for my dishwasher, I'm not quite as enthusiastic about it for my other appliances I tried it on, mainly because I did not see such dramatic results so I frankly couldn't tell if it was working, or not. 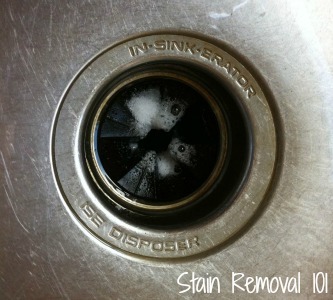 Everyone suffers from a smelly garbage disposal from time to time, so I tested this product in my own disposer to see how it worked. The instructions for using this product for your disposer are also quite simple. Just pour the packet down the drain where the disposer is located, then pour in 2 cups of water and wait 15 seconds to let it dissolve, and then turn on your water and disposer and run both for 5 seconds. Done. When I poured the packet down the drain I saw fizzing on the flaps around the disposer (see the picture to the left). So clearly I had some hard water build up on this part. Presumably I had some build up within the disposer itself as well, but I can't really see it so I don't know for sure. I think this product is supposed to just generally clean up your disposer and remove hard water buildup from it, and perhaps it does this. However, it doesn't really freshen up your drain like I thought it would. It has such a nice scent in the packet I thought I would smell the nice lemony scent for a while (kind of like I did when I tried the Disposer Care capsules) but no, I didn't. I didn't smell a thing since it all literally flushed down the drain in less than 20 seconds. Bottom line, I guess it worked fine, but I'm kind of sad I wasted a packet on the disposal, when I could have used it in the dishwasher instead. Finally, I tried this product in my washing machine, since it also said it was designed to clean this too. Again, my washing machine was not that dirty to begin with, so I didn't notice much visible difference once I'd used this product. I didn't even get any fizzing when I poured the Lemi Shine machine cleaner into the wash tub, I guess because I don't have much buildup there. Here's a picture of what my washing machine looked like as it filled up to run through a cycle with only a packet of this cleaner dissolved in the water. I think this product is designed to remove detergent and hard water build up in your washer, but doesn't necessarily sanitize it. I personally want to use a washing machine cleaner when I've washed something especially icky and don't want to transfer those germs to the next loads, so again while this did OK for this task, I suppose, I most likely won't use it for this purpose again. Instead, I'm saving all my packets to use in my dishwasher, where I was really impressed with it's cleaning power. Has anyone else used this product, in any of their appliances? If so, I'd love to hear your thoughts about how it worked for you. 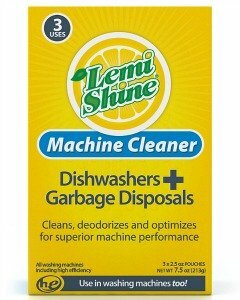 You can share your household cleaners reviews here for this or any Lemi Shine product, or really for any cleaning product you'd like. I'd love to hear from you! Further, you can share your garbage disposal cleaner reviews or home remedies here, or read lots of others that have already been submitted for keeping this appliance clean and smell free. 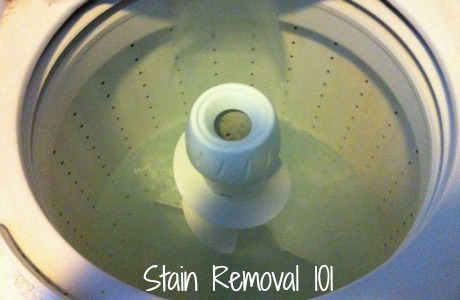 Finally, read even more tips and reviews for cleaning your washing machine here, or share your own tips and reviews. I pause mine by opening the door a tad. When I shut the door, it restarts. I think the fizzing is from dirt....hydrogen peroxide will do the same thing. Doubt very much it is from hard water build up.